Information Design Lecture at UAH! The UAH Humanities Center and the Business and Technical Writing Program proudly present a public lecture featuring Dr. Nicole Amare from University of Southern Alabama. Dr. Amare will speak about her new co-authored book A Unified Theory of Information Design: Visuals, Text, and Ethics. The event will be held on Wednesday, February 19 at 6:00 in Shelby Center 301 on the UAH campus. The event is free and open to the public. The lecture takes a holistic look at information design by providing a “periodic table” of visuals, including decoratives, images, diagrams, and text. Using this holistic approach, Dr. Amare will offer strategies for improving visual communication and avoiding ethical breaches when using visuals to communicate. 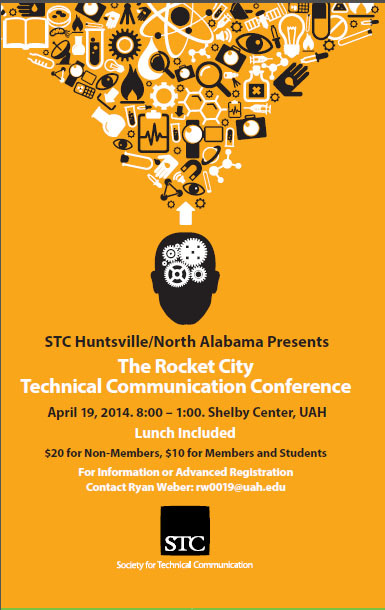 STC Huntsville/NA Sponsors a Single-Sourcing Presentation! STC Huntsville/NA is sponsoring a remote presentation on single-sourcing this Tuesday, October 15. Join STC as we hear from Liz Fraley of Single-Sourcing Solutions, who will present “What’s In It for Me?”, a discussion of the benefits of single-sourcing and content management for technical communicators. The event includes free dinner at 5:30 and the presentation at 6:00! Come to Shelby Center 301 on the UAH campus to participate in the event!